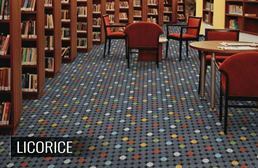 Joy Carpets leads the industry in fun, patterned carpet for residential and commercial use. 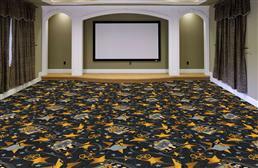 Their carpet comes in a variety of colors, patterns, and designs that fit the style of plenty of different spaces. 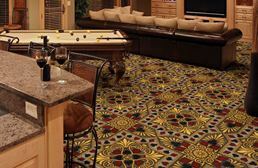 Whether you’re looking for residential carpet, or commercial carpet, Joy Carpets is the brand that has both. 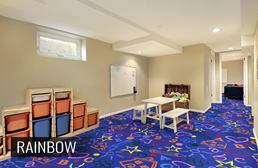 Below, we’ll outline what makes Joy Carpets unique and durable. Let’s take a look! 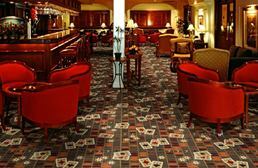 Berber refers to a specific carpet type. 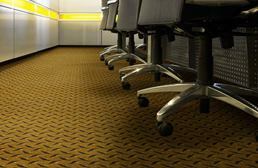 Berber carpet is found in looped styles. 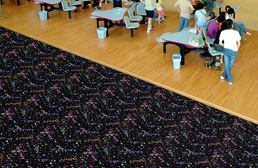 It’s a tight weave without any tufts like other types of carpet. 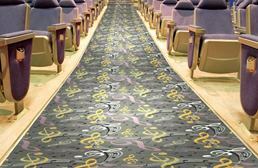 All carpets begin as looped carpets. It’s highly durable. If your home has a high traffic area with lots of animals, people, and kids running through it, berber can stand up to the challenge. 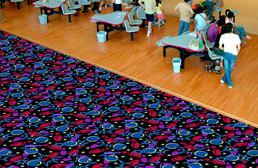 Since all Joy Carpets are berber, you’ll have an item that is highly durable, and easier to keep clean than other styles of carpets. 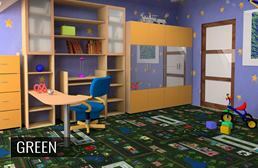 There are many options for Joy Carpets in residential spaces. 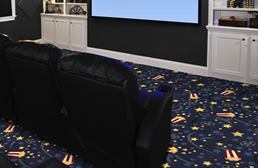 Joy Carpets works great as home theater carpet, basement carpet, game room carpet, and anywhere you want carpet, as long as it’s indoors. 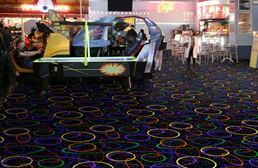 Joy Carpets has a wide range of looks, including glow in the dark carpet, kids carpet, and home theater carpet. 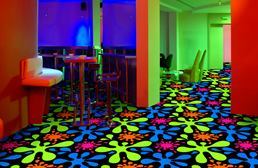 It’s certainly a different look than your average flooring. 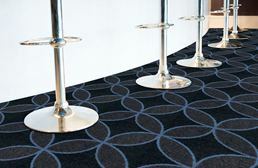 Joy Carpets is the commercial carpet of your dreams. 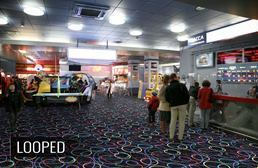 The glow-in-the-dark options are great for arcades, movie theaters, and daycares. 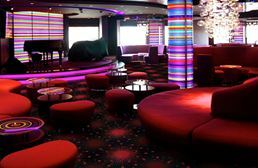 Just get a few black lights and neon lights and the party can start! 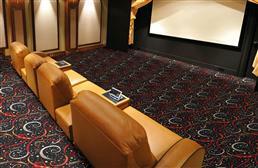 Joy Carpets offer some of the best theater carpet around. It’s thick, durable, and sound absorbing. 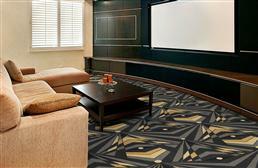 It’ll soak up that surround sound and give views a clean, crisp sound experience that’s not muddy or echoed like other flooring types. 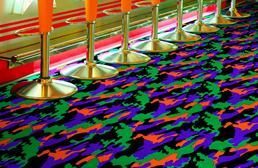 There’s also more muted designs that work well in lobbies, entry ways, and any other area that needs a durable and easy to clean carpet. 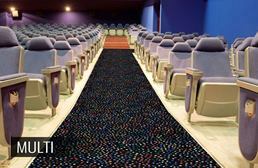 One of the most popular places to use Joy Carpets is in the theater, so let’s look at a few reasons why Joy Carpets is great theater carpet. 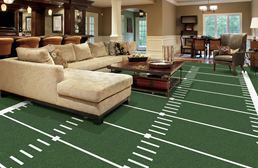 Carpet, aside from providing a warm, comforting and beautiful foundation for your space, is simply the best when it comes to sound absorption. 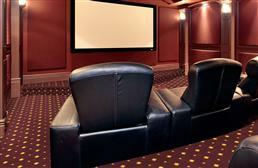 You want something that soaks up all that glorious surround sound, rather than bouncing it back to you. 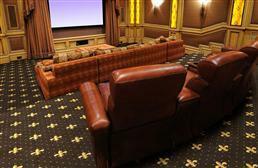 Carpet provides the best audio experience. Nothing else can even come close. 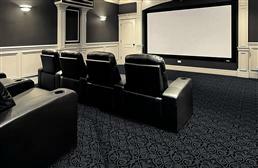 Home theater carpets are berber, which means the carpet fibers are short. 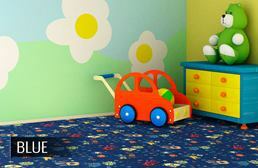 The shorter fibers naturally trap less dirt and dust. They also don’t stain nearly as easily and some are even stain and water resistant! 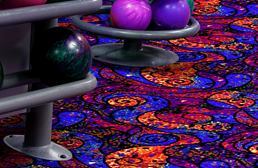 Yes, water resistant carpet. It’s a thing. 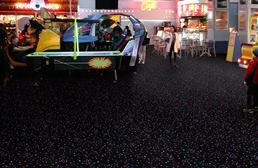 Grab your buttered popcorn and sodas, it’s no match for Joy Carpets. 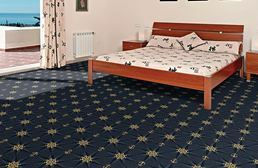 Joy Carpets is known for their bold looks. 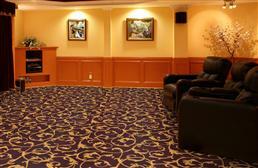 The decorative style is no different. 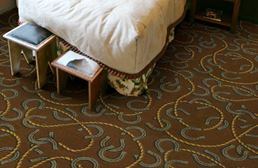 Though more muted than their other styles of carpet, decorative style features reoccurring patterns. 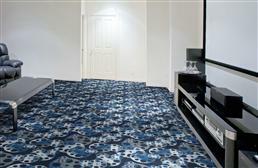 If you’re looking for more muted swirls, circles, flowers, or geometric patterns, this style of carpet is for you. 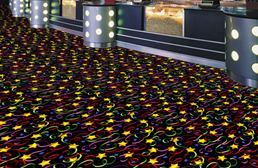 Themed carpets are how you let visitors know what space they are in. 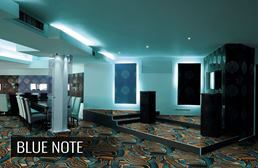 Creating a casino room? 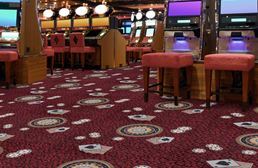 We have casino themed carpet. 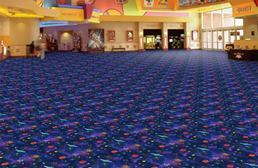 Creating a theater, we have carpet for that too! 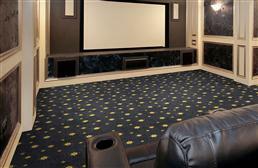 Whether you’re prepping for your fan-cave or home theater, there's a themed carpet for you. Looking for something classic or vintage inspired? Look no further than linear styles. 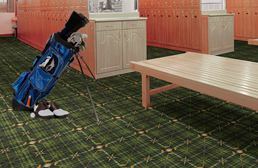 These carpets feature plaid designs perfect for a golfer’s room, library, or anywhere you’d want to regularly wear a smoking jacket (I mean, who doesn’t want to sit in a comfy chair with a fake Sherlock Holmes pipe?) 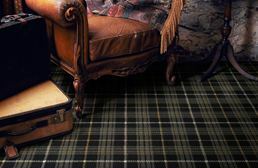 If you dream of being on Baker Street, take a look at this carpet. So maybe movie reels and stars aren’t your thing. Maybe you’re looking for a style that’s more vintage inspired, or glamourous. This is where Joy Carpets florals come in. 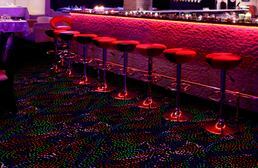 These carpets are totally glamorous and luxe. 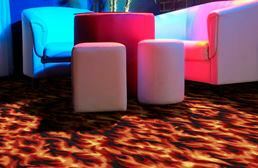 They look great for rooms that inspire to be high-end and romantic in look and feel. How often do you find brands that specialize in glow in the dark? Probably never. 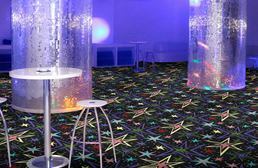 Luckily, Joy Carpets is all about glow in the dark carpet. 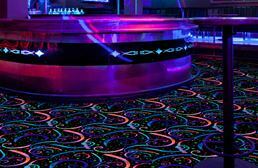 Glow in the dark carpet is usually reserved for special spaces, like game rooms, kids’ rooms, and places where neon and black lights might run abundant. 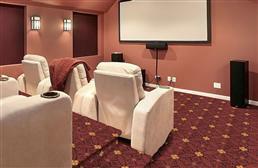 We’ve talked a lot about home theaters and game rooms, but what about kid-friendly rooms? 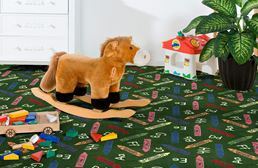 If you’re looking for a carpet for playrooms, Joy Carpets have some kid-friendly carpet styles just for you. 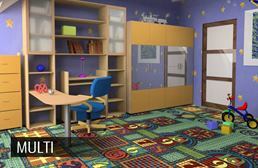 From carpets with numbers and the alphabet, to carpets with fun, kid friendly patterns, there’s a Joy Carpet perfect for your room.